Special Impish on Wednesday Issue Addendum READ REGULAR ISSUE FIRST! The Story of Impish in Leprechonia. Impish stumbles out of the teleportation rift laughing insanely only to spontaneously erupt into his ‘happy dance’. I BEAT LETHAL LEPRECHAUN AT HIS OWN GAME! Spinning around quickly to access his surroundings and determine a direction of travel to get as far away from the rift before Lethal can charge through after him, he fails to notice the tree trunk which he shakes with a solid impact from his tail WHAP! Impish clutches tail in one hand and head in the other and peers up to see what hit him. “Palm trees? No! Well ok yes, but these aren’t just palm trees, those are coconut palms. Huh. Cant smell anything but coconut oil. Might have over done that a bit. Nope, but there is that strange clicking and scratching sound that’s pretty rhythmic. Hellboy or someone worse to rain on my tropical vacation. What is that darn clicking sound? Seems like its all around and getting louder. A Sustainable Coconut and Tasmanian Crab Farming Experiment. THIS HABITAT IS CLOSED TO ALL VISITORS AND MAY REPRESENT A PERSONAL SAFETY ISSUE! “WHAT THE HELL WAS THAT? I umm…humm…must be all the excitement getting to me. For a minute there felt like there was a spider climbing my tail! The coconut crab’s claws are powerful enough to crack open coconuts, and can be used to lift weights of up to 28 kg. If coconuts are not readily available on the ground, the coconut crab can climb trees and cut them down. “OH MAN! I hope I can avoid those things! They’re creeping me out! I don’t even like seeing the King Crabs on that Discovery reality show Deadliest Catch. BOTH CRAB SPECIES ARE CONSIDER OMNIVAURS. DO NOT ENTER HABITAT EATING OR SMELLING OF RECENTLY CONSUMED FOOD. A SILKWOOD SHOWER PRIOR TO ENTERING THE HABITAT TO PREVENT YOU FROM BEING SEEN AS A POTENTIAL FOOD SOURCE! “OH MAN! They literally put that stuff on me with a paint roller too, almost an entire 5 gallon buckets worth. I gotta…Oof! AGHHH!! SOMETHING IS ON MY BACK- GET IT OFF! GET IT OFF! Impish looks and sees several crabs on his tail and at least one more between his wings and well as another 6 approaching. “Aggh!” He shakes himself like a dog trying to get them off to no avail. His attempt to unfurl his wings is thwarted by the fact the one on his back seems to have a death grip on them. Attempting the stop drop and roll maneuver gains him another across his snout. Seeing little choice as the one on his snout seems to be intent on giving him a pierced nose, Impish dashes head long willy-nilly back to the rift area which to his surprise is still open, the end of what he takes for Lethal’s Shellighi protruding from it and dives in head first. As he emerges once again back at DL/LL HQ he gets a quick glimpse of Lethal removing his shellighi from the mirror with a stop watch in his other showing the result to Hell Boy who appears unhappy and in the process of reaching for his wallet before belly surfing across the stage only to become engulfed in a dense fog of CO2. The rapid chilling to the giant crustaceans causes them to become stuporous, loose their grip and fall off Impish. The CO2 fire extinguisher wielding kitchen staff immediately treat the crabs to another burst of CO2 before seizing and stuffing them into a several very large coolers on a cart before firmly securing the lids. “Welcome back Impish! Have a nice trip? Enjoy your 4 minute 20 second vacation? What did you think of Leprechonia, beautiful paradise isn’t it? Oh, I think Hell Boy there is going to want to have a chat with you over his gambling losses once you’re off the floor He was sure you’d top the five minute mark and we’d have to come find you. Also those crabs are $50 per pound and while I’ll get an official weight from the kitchen it appears you owe me roughly $400 per crab and you brought back 6. “Here now drink this.” Impish from his prone position regards Lethal suspiciously. Impish’s eyes snap wide open then buldge, his tail suddenly snaps out straight behind him and vibrates against the stage as he shakes his head like a dog several times. Impish seems more with it after this subsidies. “Better now? Good told you you would be. Be thankful it was just the crabs. I was going to rift in from the Artic Circle where the rift is located in a den used by Polar Bears to hibernate to make me point but they had 4 cubs and I didn’t want anything to happen to them. My point was and still is when I say no I mean no. I’m not being mean or doing it to taunt you. This place and these people are not ready for the likes of you and your antics, particularly after 7 weeks of not being able to fly. As soon as Leprechonia is ready for some one/thing like you you’ll get a comped weekend stay but not before. okolehao waiting for you in your office when you get there. I’ll be takin’ me mirror back to me office now if ya don’t mind. I’ve got to go catch up on 7 weeks of paperwork and finish the September 11th 15th Anniversary Tribute Issue. 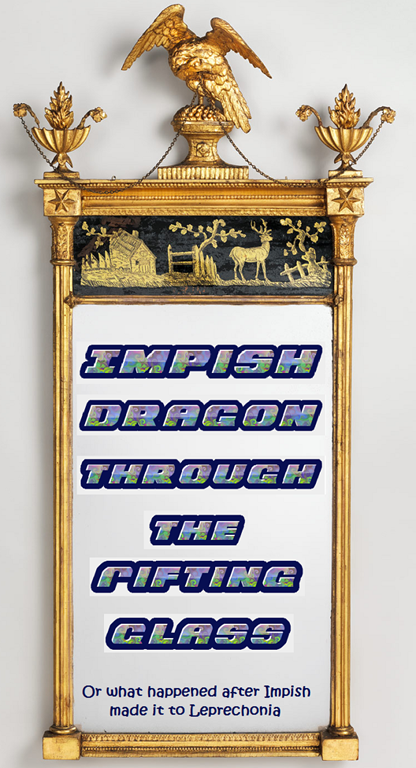 3 Responses to Special Impish on Wednesday Issue Addendum READ REGULAR ISSUE FIRST! The Story of Impish in Leprechonia. When you two get going with a tale, makes me think you both have missed your calling, Instead of reading books, you should co-author one.